If you know any more about the pictures on this page, please let us know. Or you might have some other class photographs from Eton Wick School which we could add? A photograph of Eton Porny School taken around 1907. Barbara Spicer believes the boys were aged between 8 and 13. Her father, Edmond Robert Janes, is in the second row, third from the left. If you can help with the names of any of the other boys, please let us know. Kim Devonshire has commented: I have looked closely at the Eton Porny picture from around 1907 and would like to hazard a guess that the pupil in the second from back row, three in from the left [handkerchief in pocket] is my grandfather Bill Devonshire. I guess there is no way of knowing for sure, but strong family resemblances would indicate some likelihood. A photograph of Eton Wick School taken between 1903 and 1906. At this time the older boys attended Eton Porny School. Very few in the photograph have been identified but the teacher is believed to be Miss Stern, the Head teacher. Barbara Spicer wondered if three of the children could be her 2 aunts and 1 uncle: Mary Ann Janes aged 11, Lily Janes aged 8 and Jack Janes aged 5. They lived in Gordon Place. Boveney New Town. Miss Rooke's class, standards 3 & 4 (10 and 11 year olds), 1950. Huse, Terry Harman, Conway Sutton, Alan Dowson. Cooley, Roger Wilcox, Tony Johnson. Miss Rooke, with another class. Pupils of Eton Wick Junior School packing up after a week at the Stoney Stratford camp and play acting on the penultimate night. The cost of this experience was five pounds and for some children, this was the first time away from home. I do not think this can be 1956 as I passed the 11 plus with Bobby Moss in 1956 and went to Slough High School and I think I look younger than 11 in the photo. I recognise Lenny Milton, Margaret Scarbrough, Joan Benham to name but a few perhaps they can clarify the year. which shows the cast of the school play in 1956/57. A group of teachers at the summer fair, Eton Wick School playing fields, in 1974. Left to right are: Mr and Mrs Nash (+ baby); Mr and Mrs Moss; Mr and Mrs Pearce; and Mrs Smith. The small girl is Stephanie Nash, and the taller girl is Mrs Smith's daughter, Nicky. The picture was taken by Derek Smith. Mrs Smith taught at Eton Wick school from 1960 - 1974. 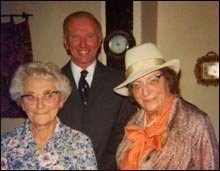 Mr Moss, the then headmaster; and Miss Rooke, former headmistress. "It did make me smile about people remembering Mr. Moss. Even though he was my Dad, I did make it to the green seat too! The brass bell inside the front door. Swimming in the pool with Mr. Nash. Shinty, Rounders, Shove Halfpenny, Darts, Michaelmas Fair with the somewhat damaged stalls that were stored at the Scouts Hut. The Football Scheme, Tombola - all school fund raising items. Even now when I got to my children's school fun raising I draw on those ideas. The bottle stall that was always the most popular! In these days of Dr. Who, the time a Dalek came to the school. Anyone recall Shakespeare's stores in Alma Road, The Co-op that became the Betting Shop? Barron's Stores? "Was fun to find this site. I usually pass through every year just to see what has changed (live in Canada now, but have to visist my Mum who is very much alive). I know we have photos of Eton Wick between my brothers and I, including ones of the entire school from the 60's. Anyone go on the trips to Holland with the school, or the ones to Wolverton when in Class 4? Can think of so much more, but enough for now. Will be happy to reply to any e-mails! And still have my trophy from winning the 50 year 5 a side with Andrew Piasecki, Clive Paintin, Neil Simpson and Paul Miles! All the best. Jim "
Please share your memories of Eton Wick School by using the comment box below.